929 classic remake Applicable to the original EMT turntables 930,938,948 / 950 And other turntable..
997 (banana arm) engraved version Special treatment applied to other disc ..
德國 霸銘 Brinkmann Audio由音響狂熱份子Helmut Brinkmann先生於上世紀八十年代創立，一直醉心鑽研發燒黑膠重播系統及各類高保真擴音機產品，自家工場擁有高精度電腦數控車床及各.. The »10.0« has a close resemblance with the »10.5« tonearm. Various component parts that have proved..
UNIVERSAL Lightweight stability A mechanical masterpiece of both design and functionality, Cle..
VERIFY Elegant listening The Verify tonearm presents Clearaudio's innovative and groundbreakin..
E.A.T. has joined forces with tonearm wizard Bob Graham to develop the E-Go, a tonearm that extracts.. This is a 9 inch tonearm with unipivot bearing design with a unique, rigid round headshe.. This is a Stogi S 12 inch version tonearm with a fully precise adjustable VTA towe.. This is a 12 inch version of Stogi S unipivot tonearm. It is a unipivot bearing desig..
Ortofon AS-309S 12" static-balance tonearm AS-309S 12 inch static-balance tonearm..
Ortofon TA-210 12" static-balance tonearm The Ortofon TA-210 tonearm has go..
SME engineers, recognising the potential of the latest complementary equipment, accepted the challen.. The THALES SIMPLICITY II sets the benchmark for what is possible in tonearm-design today. 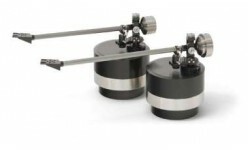 The trac..
LTD is a highly refined version of the Well Tempered Lab tonearm,featuring the new Symmetrex configu..